Win a $50 Gift Certificate to Cantina Laredo! Congratulations to Jason Adams on winning our third High Five Giveaway and thank you to all who entered! 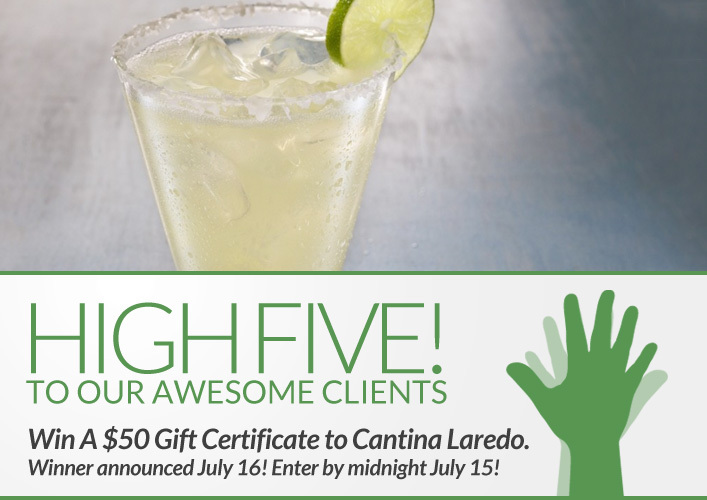 Our next High Five Giveaway is for a $50 gift certificate to Cantina Laredo. What is the #5 global hair concern? Now, just add a comment to this post with the right answer to be eligible to win! The winner will be announced on Monday, July 16. Entries must be received by midnight on Sunday, July 15. Lack of volume is the #5 global hair concern.I really Aveda products. Lack of volume is the # 5 global hair concern. Answer: Lack of hair volume! Lack of volume is the #5 global hair concern. Lack of volume..!! I love me some big hair, pass the teasing comb please!